The State’s “disturbing” climate performance leaves us completely off course to meet the very emissions targets that its key climate plan is meant to set the roadmap to achieve, the High Court has heard. 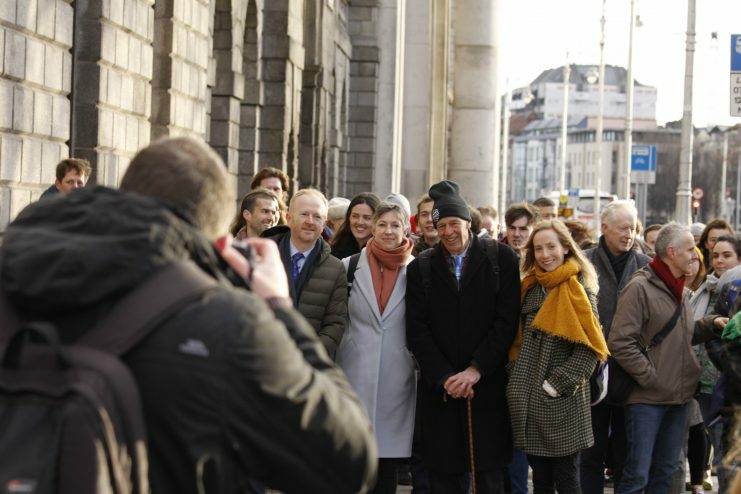 The court is currently hearing a landmark climate case brought by Friends of the Irish Environment (FiE) as the group – under the Climate Case Ireland moniker – seeks an order to quash the National Mitigation Plan. FiE argues that the Plan is not designed to achieve substantial emissions reductions to halt rising emissions and is thus a clear breach of constitutional and human rights. The case has attracted overwhelming public attention. The public gallery was full with around 110 onlookers this afternoon, including Green Party leader Eamon Ryan TD who joined many citizens forced to sit on the ground due to a lack of available seating. Mr Justice Michael MacGrath even stopped proceedings at one point to allow more members of the public into the courtroom, directing them to available floor space close to his desk. “It’s obviously attracted a good deal of attention and I would like to thank those who sat attentively and listened to the arguments by all the sides,” Mr Justice MacGrath said. 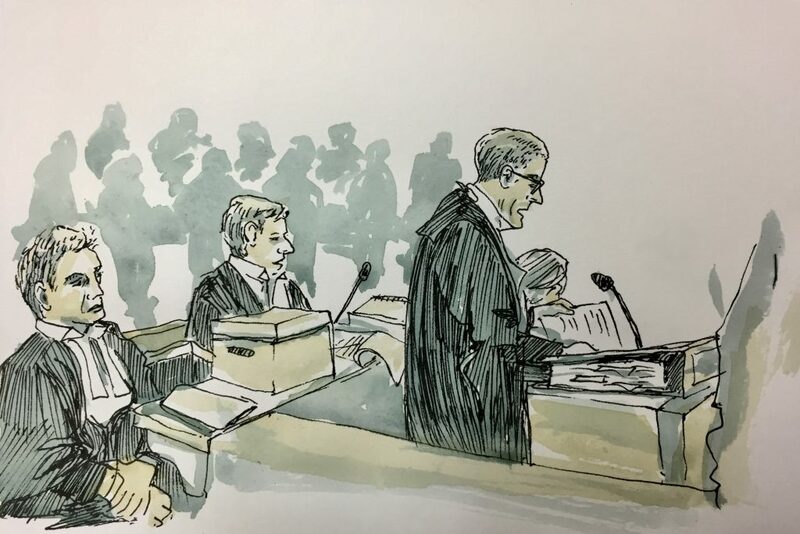 Speaking during the closing segment of proceedings that lasted four days, counsel for the applicant, Brian Kennedy SC, said that the Plan “is not fit for purpose”. It has resulted in a “disturbing state of affairs” where emissions are rising rather than decreasing with a “bright line between where we are and where the State needs to be,” he added. He pointed to the “striking” findings in the latest annual report from the State’s own Climate Change Advisory Council (CCAC) that finds the State well off track to meet both its 2020 or 2030 EU targets. The CCAC report, Mr Kennedy said, also finds that the State has “not provided the roadmap” for the transition to a low-carbon society by 2050. Counsel for the State, Niamh Hyland SC yesterday said that new European carbon accounting rules now allow for the transfer of carbon credits which would bring down our 2030 emissions reduction target of 30 per cent in the non-ETS section as compared to 2005 levels. Ms Hyland said the transfer of carbon credits that the State has banked would mean that we would end up with an effective EU target of emissions reductions of 20.5 per cent by 2030. The flexibilities outlined by Ms Hyland are only a “short-term fix”, Mr Kennedy said, and won’t stop emissions. The trading scheme simply allows for the transfer of credits as opposed to policy decisions to bring about aggregate emissions reductions, he said. While the State “can pay lip service” to its effort to reach our short and medium-term targets, Mr Kennedy said that “on its own evidence, it is well away from meeting its 2030 target”. “We will have higher emissions in 2030 than we did in 1990,” he added, with an estimated 57.8 Mt CO2 eq in 2030 compared to 55.4 Mt CO2 eq in 1990. “Even under the State’s latest numbers, things are getting worse,” Mr Kennedy said. Speaking yesterday, Ms Hyland said that the case is not really about the Plan and is “just a vehicle” for FiE to seek a statement from the courts that the State’s approach to limit emissions is unconstitutional. She said that the applicant is essentially seeking a judgement that would see the judiciary “put straight into the position of the executive… telling the state what [emissions] reduction is to be achieved by a particular date”. The notion, she said, that someone unhappy with determined targets could come before the courts and seek a judgement for higher targets is not acceptable as “those choices are quintessentially for the executive to decide”. Mr Kennedy, however, said that the logic being adopted by the State is that the plan is in “some zone of immunity in which the court is not in a position to act or intervene”. Earlier in proceedings, Eoin McCullough SC, also counsel for the applicant, said that the State’s line of argument is a “false premise that lies right through the State’s submissions”. “[The State] says that the applicant is trying to impose what it calls a positive obligation [on the court] to deliver a particular prescribed plan,” he said. In fact, Mr McCullough said, the applicant does not seek to prescribe the types of emissions reductions that must be made nor does it seek a declaration that the State must bring about a certain level of emissions reductions. Mr Justice MacGrath said that he will aim to deliver a decision as soon as possible.